When someone asks if you've had Botox. ALICE THROUGH THE LOOKING GLASS A sequel, especially when it's meant to cash in the success of the original and is cut loose from a director with a defined flair and sensibility, can be a bit of a letdown. 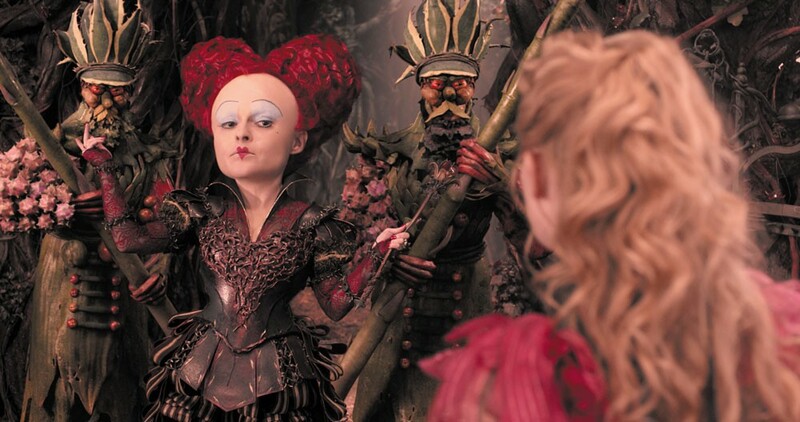 In this case, director Tim Burton took leave after directing 2010's box office behemoth Alice in Wonderland and turned over his chair to the unremarkable James Bobin of the recent Muppet movies. Burton's vaunted knack for visual storytelling has faded in this century with his career arc favoring remakes, reboots and re-imaginings. Really, for all its haul at the gate and Oscar-winning production design, the original Alice was a bloated affair, one eager to take Lewis Carroll's original story and characters and veer off into something far from its creator's singularly surreal world of fantastical nonsense into, well, just well-marketed nonsense. If one had quibbles about how Burton's Alice strayed from Carroll's tale, Bobin's film won't make up for it, since the plot on screen bears almost no resemblance to that story, instead putting its characters into a convoluted plot. Alice (Mia Wasikowska) has returned from captaining her father's ship on a journey to China, and finds she and her mother's fortunes at the mercy of spurned suitor Hamish Ascot. Alice is summoned back into wonderland by caterpillar-in-butterfly-form Absalom (voiced by the late Alan Rickman, the very fact of which carries the closest thing the film has to any emotional wallop). And there the rather forced whimsy and rote CGI set pieces get up and running. Anne Hathaway and Helena Bonham Carter slum along, reprising their respective roles as the White and Red Queens with, of course, Johnny Depp back as the Mad Hatter. A presence of overwrought twee-ness that was barely tolerable the first time around, even in a movie clearly aimed at much younger audiences, Depp's Hatter belongs with such recent incarnations as a mopey Willy Wonka in one of Burton's other misbegotten blockbusters. It all leaves one longing less for Captain Jack Sparrow than stock footage of Depp and Hunter Thompson shooting at beer cans out in the boonies just to snap matters back into the zone of anything interesting. As part of a plot that involves Alice fighting the manifestation of time (played by Sacha Baron Cohen, slumming a couple notches above the rest) for control of something called the Chronosphere, my mind wandered to thinking about Terry Gilliam's Time Bandits, which more than three decades ago was the sort of fantasy-adventure film — both silly and thought-provoking — aimed at younger audiences, which doesn't exist anymore. If anything, Gilliam's story had more of the cheeky, droll Brit sensibility that murmured through Carroll's trippy 19th century tales as its characters jumped through points of time backward and forward, never treating its audience like a focus group for a new theme park attraction. Thirty-five years on, Time Bandits is fresh in my head, right down its loopy conceits and Monty Python-bred humor. Only about 35 hours later, Through the Looking Glass was fading from my mind faster than a gaudy Super Bowl TV spot. PG. 113m. FORTUNA. X-MEN APOCALYPSE. As the X-Men film series zips along in fits and starts, one ponders where this whole arc of stories ultimately leads and whether it's ever capable of ending at all. It's to the credit of this franchise that it remains nimble after all this time and that each film stands on its own merits. There's no way to put this movie in a jar for observation and not make the obvious comparison to this year's other comics-spawned tent poles, the awful Batman v. Superman and the damn outstanding Captain America: Civil War. Apocalypse falls somewhat in between, something fitting for a franchise that neither blew on the launch pad like the start to DC's Justice League slog, nor picks up the creative head of steam in Marvel's Avengers series and its corollary movies. It's overlong, the big sequences are great but nothing mind-bendingly original. PG-13. 144m. FORTUNA. BROADWAY and MILL CREEK listings were not available at press time. For showtimes, see the Journal's listings at www.northcoastjournal.com or call: Broadway Cinema 443-3456; Fortuna Theatre 725-2121; Mill Creek Cinema 839-3456; Richards' Goat Miniplex 630-5000. ME BEFORE YOU. Carpe diem love story about a caregiver and a suicidal quadriplegic man. PG. 110m. TEENAGE MUTANT NINJA TURTLES: OUT OF THE SHADOWS. Megan Fox and Will Arnett in the franchise that launched a thousand lunch boxes. PG-13. 112m. FORTUNA. POPSTAR: NEVER STOP NEVER STOPPING. Andy Samberg plays a fading Bieber-ish boy-band star desperate to stay in the spotlight in this song and cameo filled music biz comedy. R. 86m. THE ANGRY BIRDS MOVIE. From your iPhone to the big screen, grumpy animated fowl hurl themselves at interloping pigs. Voiced by Jason Sudeikis and Maya Rudolph. PG. 97m. FORTUNA. CAPTAIN AMERICA: CIVIL WAR. The Avengers assemble and rumble in a well-made, satisfying action movie that handles tricky politics and gives promising starts for new characters. PG13. 147m. FORTUNA. THE DARKNESS. A family visits the Grand Canyon and all they get is this ancient evil haunting them and leaving creepy handprints everywhere. With Kevin Bacon. PG13. 92m. THE JUNGLE BOOK. The Kipling story returns to inspire real childhood wonder with seamless CGI, believable animal characters and grand adventure. PG. 106m. THE MAN WHO KNEW INFINITY. True story of an Indian mathematician (Dev Patel) and his British Cambridge mentor (Jeremy Irons). R. 97m. NEIGHBORS 2: SORORITY RISING. Woman-positive, gross, funny sequel to the original Greeks vs. Grownups comedy that actually has something to say. Seth Rogan, Rose Byrne, Chloë Grace Moretz and Zac Efron. R. 92m. FORTUNA. THE NICE GUYS. A grimy-cool 1970s L.A. detective comedy with Ryan Gosling and Russell Crowe finding chemistry and humanity in their hangdog characters. R. 116m.